You are here: Home / Buying a Mattress / Tempur-Pedic Mattress: Worth the Money? Laundry day. You can see that our dog also prefers the Tempur-Pedic over her dog bed. The traditional innerspring mattress has been around for generations, and it is the mattress found in most homes. However, modern technologies have led to mattresses of a different kind. These mattresses forego the steel coils and instead contain a core of foam to support the sleeper. Memory foam cores have revolutionized sleep for many people, and the Tempur-Pedic mattress leads the way with this new bed-building approach. Memory foams like Tempur-Pedic are a type of visco-elastic polyurethane foam, which changes in density when heated. Although a memory foam mattress feels dense or even hard to the touch, it quickly reacts to the body’s warmth and molds perfectly around it. Why Choose a Tempurpedic Mattress? Tempur-Pedic mattresses were the first of their kind. The Tempur foam, or temperature sensitive foam, was first developed for NASA. It was then used in hospital beds to help prevent bedsores and to keep patients from losing blood flow to areas of the body from prolonged bed rest. Unlike innerspring beds, which often put increased pressure on certain areas of the body and form ruts or indentations over time, Tempur-Pedic foam evenly supports the body without creating pressure points. Memory foam also has the ability to shape to the unique contours of a sleeper’s body and then shift back to its original shape after use. For decades the Tempur-Pedic mattress has been manufactured to the highest standards. Although there are other memory foams now on the market, few are of the same quality as Tempur-Pedic memory foam. For this reason, shoppers unwilling to compromise on quality often choose Tempur-Pedic mattresses despite their sometimes higher price tag. Tempur-Pedic mattresses are often more expensive than innerspring mattresses or other brands of memory foam mattresses. However, while most mattresses last a mere 5 or so years, a Tempur-Pedic mattress will function for more than twenty years– so that extra money is well spent! My own Tempur-Pedic mattress is about 10 years old, and still going strong. Tempur-Pedic mattresses are generally a good choice for those with asthma because they are less susceptible to dust mites and mildew. However, new memory foams tend to emit an odor, which smells something like paint, and this odor can bother some people. It typically goes away within a week or so. Despite these minor concerns, a Tempur-Pedic mattress will provide one of the more comfortable sleeping experiences. And unlike some memory foam mattresses, which often use cheaper, inferior foam, Tempur-Pedic mattresses offer the highest quality and can easily last a lifetime. Any serious mattress shopper should test out a Tempur-Pedic mattress and at least consider the investment. I’ve personally owned a tempurpedic mattress for approximately 10 years now, and I totally love it. I can’t recommend it highly enough. Whenever you travel and sleep on a different bed, you start thinking about how good your own bed is going to feel when you get back home. They’re that good! I bought my Tempur-Pedic at full retail price from a local mattress store. I am not associated with the company in any way, and I do not work in the mattress industry. I didn’t really know anything about mattresses 10 years ago, and just bought it because I was convinced by the advertising, and I got lucky! 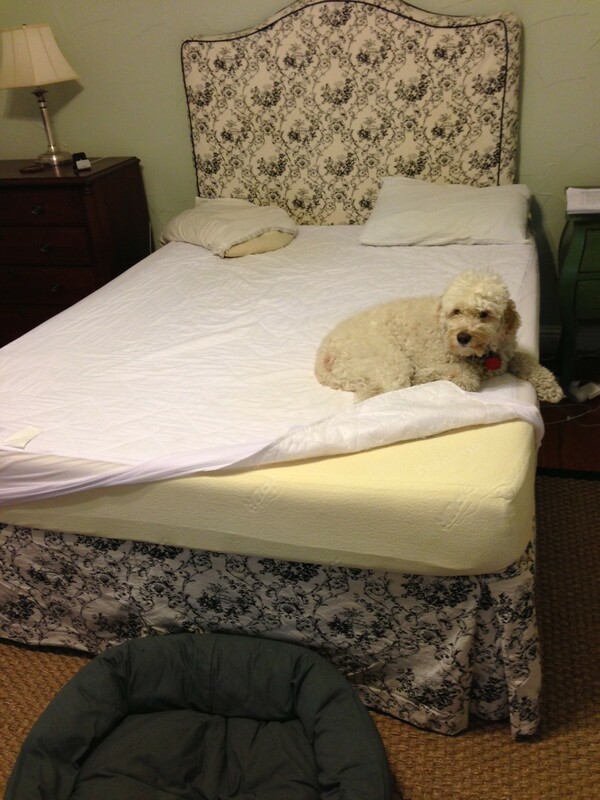 That is a real picture of my dog sitting on my 10 year old, queen sized, standard Tempur-Pedic mattress. I don’t know if they even made multiple versions when I bought mine. At the store where I bought it, the only option was the size. Don’t want to take my word for it? How about the opinion of Consumer Reports? In their 2012 mattress rating article based on more than 12,000 consumer responses, Tempur-Pedic had the highest satisfaction rating of any mattress. Seems like it’s worth the money to go with this top brand, to me. However, not everyone feels the same way about them. Some people find them uncomfortable, although I personally can’t imagine how or why. The company does offer a really good money back guarantee offer though, where they’ll take it back if you are unhappy with the mattress. So if you end up hating yours after trying it for a couple of weeks, you aren’t stuck with it. Temperpedic mattresses are definitely not cheap. But consider how many hours of your life are spent sleeping, and what a difference a good night of rest makes. Also, consider how many years a typically mattress lasts. If you think about how much money you probably spent on your last laptop, or television, that won’t last nearly as long, or how much money you spend on a car payment every single month, you’ll see that spending a little more on your mattress isn’t that big of a deal in comparison. Read my other article comparing the Tempur-Pedic to latex mattresses. Anyone else out there own a Temperpedic mattress? What has your experience been? Leave a comment and let us know.